Gardeners in chilly-summer states don’t have the best luck with sun-loving tomatoes. But hot summers can be tough on these summer garden staples as well. If you live where ordinary tomato plants wilt under intense heat, you may want to consider Heatwave II tomato plants. What is a Heatwave II plant? It’s a hybrid tomato (Solanum lycopersicum) that likes it hot. Read on for more Heatwave II information and tips on how to grow Heatwave II in your garden. What is a Heatwave II Tomato? According to Heatwave II information, this cultivar grows perfectly well in intense summer heat. Even if your summer temperatures rise to 95 or 100 degrees Fahrenheit (35-38 C.), Heatwave II tomato plants just keep on growing. They are perfect for gardeners in the Deep South. Heatwave II is a determinate tomato plant, meaning that it’s more of a bush than a vine and needs less of a support system. It grows to 24 to 36 inches (60-90 cm.) tall and spreads out to 18 to 24 inches (45-60 cm.). These tomatoes mature early, in as little as 55 days. Heatwave II hybrids are medium-sized fruit, each one weighting around 6 or 7 ounces (170-200 mg.). They grow in round and a beautiful bright red, great for salads and sandwiches. If you are interested in growing Heatwave II hybrid tomato plants, you’ll be happy to learn that they are extremely disease resistant. Experts say that they resist both fusarium wilt and verticillium wilt, which makes them a sure bet for the garden. Plant Heatwave II tomato plants in full sun in the springtime. 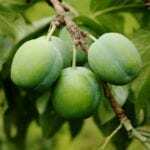 They grow best in rich, moist organic soil and should be spaced between 30 and 48 inches (76-121 cm.) apart. 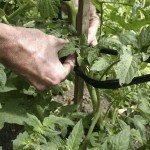 Plant the tomatoes deeply, burying the stem up to the first set of leaves. Water well after planting and, if you decide to stake or cage Heatwave II hybrids for an easier harvest, do it now. If you don’t, they may sprawl on the ground but you’ll get more fruit. Pick your tomatoes regularly as they ripen. If you don’t, your Heatwave II tomato plants can get overloaded.